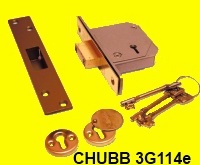 We will always attempt to give a fair price, through our WEB SHOP for the CHUBB LEVER LOCK or any other type of lock. 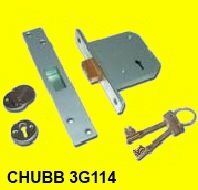 If you are looking for the CHUBB LEVER LOCK, then our Discounted Lock Sales WEB SHOP is the answer for you. Here at North London Locksmiths Ltd. having been established at our Locksmith Shop base for more than 30 years, we know how important it is to keep the cost of good quality locks reasonable, this is why we want to pass on to you locks at a fair and reasonable price. IF YOU HAVE LOST KEYS OR ARE MOVING INTO A NEW HOME AND DO NOT NEED TO REPLACE THE WHOLE CHUBB LEVER LOCK, THINK OF JUST CHANGING THE LEVER PACK, WHICH IS A FAR CHEAPER OPTION. It has a boxed a larger extended strike plate, for additional strength, for the frame side and comes with all screw fixings. 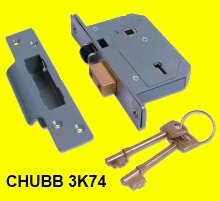 The Chubb 3G114e 5 Lever Deadlock is locked or unlocked by key from either side. The lock comes with matching escutcheons in brass or satin, for inside and outside of the door. The Chubb lock has a 5 lever mechanism, which can be keyed alike, It has a minimum of 1000 differs and is supplied with 3 keys.The case comes either in a grey silver finish and the face plate comes in either brass or satin chrome finish. It is Insurance approved and conforms to the newer British Standard 2004 requirements. The deadlock can be supplied with micros witches for use with an alarm system. Extra keys can be supplied on ordering this lock. Recommended by Police and Insurance Companies. 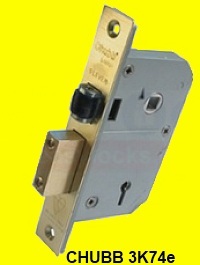 The Chubb 5 Lever 3G114 Deadlock is locked or unlocked by key from either side. The lock comes with matching escutcheons in brass or satin, for inside and outside of the door. The Chubb lock has a 5 lever mechanism, which can be keyed alike, It has a minimum of 1000 differs and is supplied with 2 keys. The case comes either in a grey silver finish and the face plate comes in either brass or satin chrome finish. It is Insurance approved and conforms to the older British Standard requirements. The deadlock can be supplied with micros witches for use with an alarm system. Extra keys can be ordered with this lock. mortice sashlock with 20mm Bolt, it has 5 Lever with anti drill plates. The Union 3K74e 5 Lever British Standard EN 3621 mortice sash lock has a roller latch bolt that is withdrawn by a lever handle from either side, (handles not supplied). The lock is universal so can be fitted on left or right hung doors. The Union 3K74 5 Lever British Standard EN 3621 mortice sash lock comes in a brass or satin finish. Available in either 2 ½” or 3”. It comes supplied with strikers and all fixings plus fitting instructions. Formerly made by the Chubb brand is now under the banner of Union. 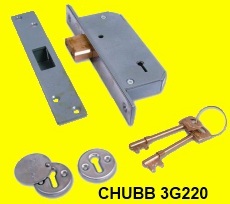 The Older CHUBB LEVER LOCK/Union 3K74 5 Lever British Standard (BS3621) mortice sashlock is the old BS lock that conforms to BS3621:1998 with 14mm Bolt, it has 5 Lever with anti drill plates. The Union 3K74 5 Lever British Standard (BS3621) mortice sash lock has a roller latch bolt that is withdrawn by a lever handle from either side, (handles not supplied). The Union 3K74 5 Lever British Standard (BS3621) mortice sash lock comes in a brass or satin finish. The CHUBB LEVER LOCK 5 lever Narrow Sile 3G220 Deadlock by Chubb is locked or unlocked by key from either side of the door. The 5 lever mortice lock conforms to the old BS 362 and has 5 levers with an extra long 20mm bolt. It is fitted with hardened plates on both sides of the lock. There are a minimum of 1000 key differs. It comes in a Brass finish or a Chrome finish and is supplied with 2keys and matching escutcheons to the finish of the face plate, as well as all fixing screw. This Chubb Lever Lock is ideal for narrow style doors, such as French doors, will also fit into the average aluminum sectioned door stile. If you cannot find the CHUBB LOCKS or any other locks, you are looking for, on our WEB SHOP please fill in the form below, giving full details of lock required, and we will respond with a Discounted Lock Sales price as soon as possible. Alternatively you can visit our Locksmith Shop or telephone our office on 0208 800 6041 to speak to a member of our Locksmith Team, who will be happy to give advice on Locks and Keys. I would like a price for supplying the following lock/s.